Australia cruise deals can be had at any time in the year, and because of Australia’s proximity to so many fabulous ports of call, the possibilities are endless for a fascinating vacation set amid the pristine beaches and tropical locales in the South Pacific. Here are just seven of the best Australia cruises, which include something for everyone. 1. Cruises from Sydney to the wonders that behold you in the South Pacific can be had on a P&O Cruise to the lovely Fiji. Stops along the way explore the beauty that is New Caledonia, on this 9 night cruise. 2. 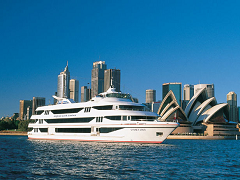 If you are new to cruising or simply want something different to do for a few days, there is a ‘sampler cruise’ from Sydney that is a ‘cruise to nowhere’ aboard a small ship so you can see the sights around Sydney up close and in an intimate, interesting way. 3. Australian cruises from Brisbane aboard P&O cruises offers an 11-night Island hop in the South Pacific. Visit the Mysterious Island, New Caledonia, and Champagne Bay on this exquisite adventure. 4. Australia cruise deals can be had while taking in the beauty and grandeur that is the Great Barrier Reef. A seven night cruise roundtrip cruise from Brisbane also stops in Whitsunday Island, Port Douglas and Cairns. 5. Tasmania cruises are just a short overnight jaunt from Melbourne on the mainland. Situated just across the Bass Strait, Tasmania offers you plenty of natural beauty and unbridled wilderness along with amazing wildlife indigenous to the island. 6. If an Eco-tour is more to your liking, then you will love the Queensland Tours which take you to the Great Barrier Reef and are equipped with dive masters to lead you through the pristine waters around the fabulous island stops. Small, intimate ships in an expedition style await you. 7. No cruise vacation to Australia would be complete without a trip down the Murray River aboard a riverboat. Explore the wildlife, the coastline and the amenities on board when you meander down the river in an old fashioned paddle-wheeled steamer. Australia cruise deals are as varied as the ports of call on the cruises themselves. South Pacific cruises to lovely destinations can be found from all of the major ports throughout Australia but you can also cruise around Australia and take in her natural wonders as well. The choice is yours, but be sure you check out all of the wonderful Australia cruise deals before you book your vacation of a lifetime.